Designed to encourage the promotion of Mexico’s tourism products and services and increase the flow of visitors from domestic and international markets, Tianguis Turístico is the largest hospitality event in the country. Here Eleanor Hawkins reports for Breaking Travel News from the show and discovers a feeling of optimism surrounding the ever growing sector. 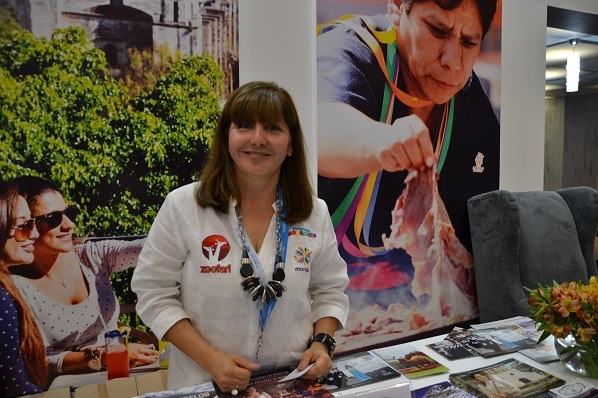 The 41st Tianguis Turístico Mexico exhibition, this year held in the city of Guadalajara, welcomed 79 countries through its doors - the largest number to date. 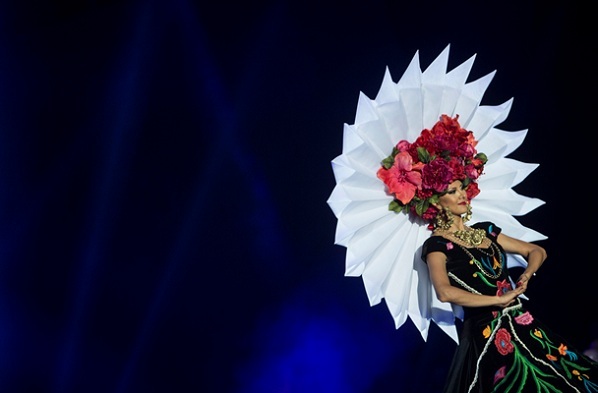 The four-day event is the primary promotional platform for tourism in Mexico and one of the largest events of its kind anywhere in the world. Tianguis is designed to increase tourism traffic to the country by promoting Mexican history, culture and natural beauty. It works to build and maintain professional relations with both local and international representatives from the tourism industry. Over 3,100 exhibitors are represented at the event, spanning the breadth of the country and covering all aspects of tourism. 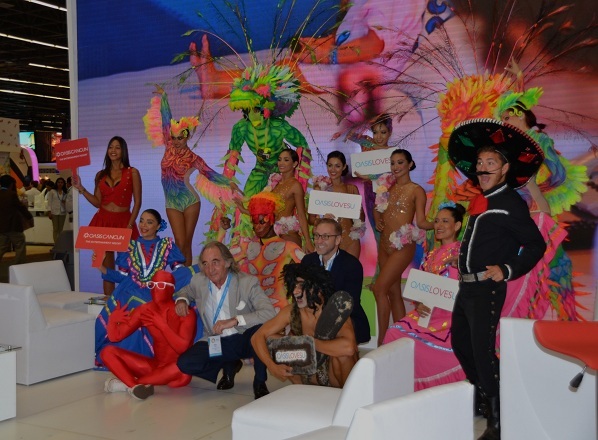 From adventure holidays to spas and boutique hotels to business travel, representatives from Mexico’s diverse tourism industry occupied over 550 colourful stands. This year Tianguis had a focus on wedding and romance tourism, tourism marketing and conference tourism. There was also a special focus on Mexico’s gastronomy, the highlight of which was the Gastronomic Pavilion with many stands offering tasters of local cuisine. Mexico’s largest hotel chain, Posadas, teamed up with world-renowned chef Ricardo Muñoz Zurita to celebrate this theme by creating a traditional menu of local dishes. A purist at heart and anthropologist by nature, Zurita has 30 years experience of traveling the length and breadth of Mexico uncovering original recipes of traditional dishes which will be adapted for Posadas Fiesta Americana Hotels from May. “We have the opportunity to revive some of the great classics of Mexico’s kitchen that will showcase the best local and national flavours,” explains Zurita of his new menu. Posadas has 140 premises in beach and city locations across the country. Tianguis Turístico is an important showcase for the Mexican tourism industry and this year hosted around 32,000 business appointments. The fair welcomes the participation of tour operators and tourist boards from Pacific Alliance member countries including Colombia, Chile, Mexico and Peru in order to increase tourism traffic between the destinations. By strengthening working relations, AP hopes to aid ease of travel between the territories and international traffic into them. Following investment and hard work in the sector of Lesbian and Gay tourism Morelos was this year in receipt of the ‘LGBT Award’ from the Federal Ministry of Tourism. 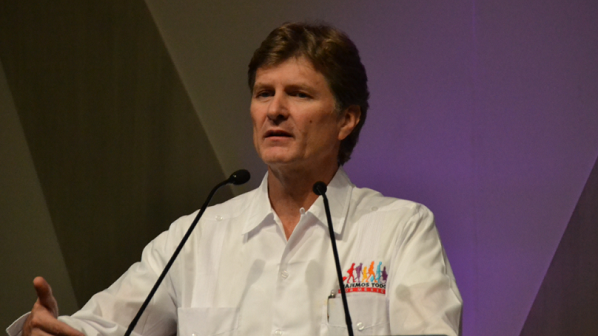 Salgado expects to meet over 100 new people or companies from exhibiting at Tianguis. The tourism industry currently makes up eight per cent of Mexico’s GDP but all parties are keen to get this up to double figures. According to data from the World Travel & Tourism Council, tourism in Mexico generated a total of $US189 billion in GDP in 2015, with the sector three and a half times the size of the banking sector in and more than one and a half times the size of the education sector in the country. Mexico president Nieto attended the event, illustrating its importance to the destination. In his opening remarks he unveiled a government initiative, the ‘Gran Plan’, designed to increase travel for domestic tourists. 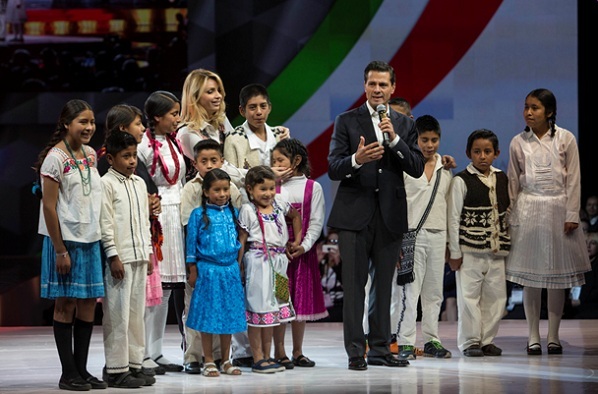 Joined on stage by the first lady, (actress and model, Angelica Rivera), and children from the Mazahoua tribe, some 1,100 guests were invited to the inauguration ceremony. All areas of the tourism industry including airlines, hoteliers, transportation companies, national and international buyers, and members of the diplomatic corps accredited in Mexico were in attendance. Enrique de la Madrid, Mexico’s new minister of tourism was in attendance and keen to emphasis what other benefits could be gained from the tourism industry. De la Madrid explained the Gran Plan has the tag line ‘Let’s all travel through Mexico’ and offers discounted plane seats and hotel rooms for low-income indigenous people. This has the intended dual benefit of providing travel experiences for those who would otherwise not be able to afford it and filling empty plane seats and hotel rooms at off-peak times. Despite this acknowledged issue of unused services, Tianguis is focused on growth. Aeromexico announced a new direct flight from Amsterdam to Mexico City, reinforcing the airports reputation as the ninth most important in the world for connectivity. Fostering the growing economic impact of tourism in Mexico, Tianguis helps to diversify markets. Tianguis Turístico is the seventh largest centre of its kind in Mexico and it’s location in Guadalajara, (Mexico’s second largest city) in the westerly state of Jalisco makes it ideal for hosting international and national trade shows. Expo Guadalajara, with a capacity of 60,000 people, is located just 35 minutes from the airport making it an ideal headquarters for international events. A celebration of Mexico’s tourism industry to date and future innovations, Tianguis Turístico is a great showcase for a booming industry. Next year Tianguis Turistico will return to its birthplace of Acapulco for its 42nd addition.